Santa Fe Mission Depot, Albuquerque, N. M.
Santa Fe Mission Depot, Albuquerque, N. M.—Albuquerque is a very ancient and interesting settlement, being on an elevation of 5,000 feet above sea level. The first explorers of this region were the Spaniards from Mexico. The city was founded by them in 1706. The territory is noted for its many curious and interesting missions which were inhabited by the missionaries in the sixteenth and seventeenth centuries. 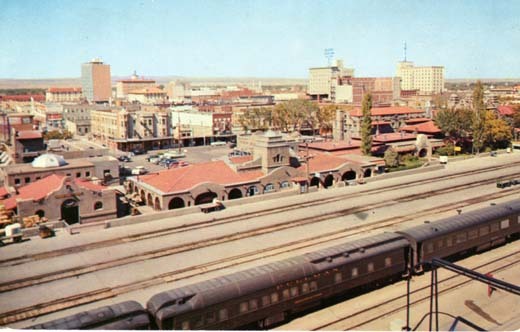 Fred Harvey Indian Building and Alvarado Hotel viewed across the Santa Fe R.R. tracks. To the west is the rapidly growing city of Albuquerque, New Mexico. 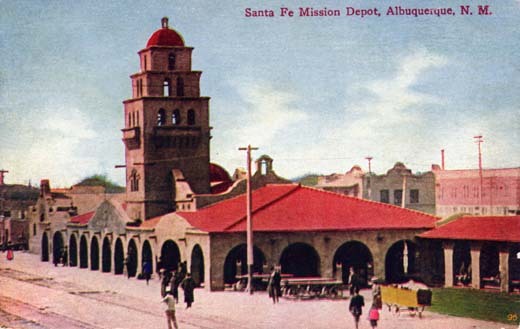 Santa Fe “Super Chief” at Albuquerque, New Mexico. 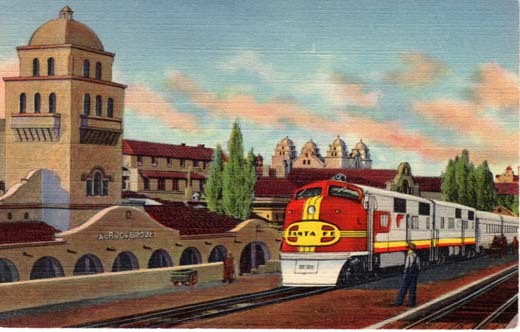 A crack streamlined train of the Santa Fe Ry., in front of the Depot and Alvarado Hotel, ready to continue its journey from Chicago to Los Angeles. Southwest Post Card Co. Box 685, Albuquerque, N. M.